Welcome back to Taylor’s Top Shop! In this edition, I’m spotlighting some of our favorite musicians’ western statement pieces. Let’s take a wild ride into why these artists chose these fashionable items and why YOU should, too. We’ll go from head to toe. Yipee ki YAY, am I right!? Country musicians of all sub-branches have grown out their hair, from Alan Jackson to Kid Rock. Current rising artists in our scene have grown their followers along with their luscious locks: the Read Southall Band, for example. Bassist Jeremee Knipp has a signature hair flip while rocking out on stage, although he says once a piece of “Orbit Sweet Mint felt particularly terrible” stuck to his hair for an entire outdoor set. Knipp also told TMP he grew his hair out mostly due to lack of finances for hair cuts. It’s hard for a wild-haired guitarist out there, y’all. You can achieve this legendary look by lightly washing your hair and applying Moroccan oil like Knipp. However, watch out for humidity. Knipp says it’s the “hair Devil.” Definitely worth looking like a head-banging baddie, though. The California hipsters *cringe* made rose-colored shades trendy again for mainstream wearers. On the other hand, western fashion has always embraced a good colored-lens with vintage frames. 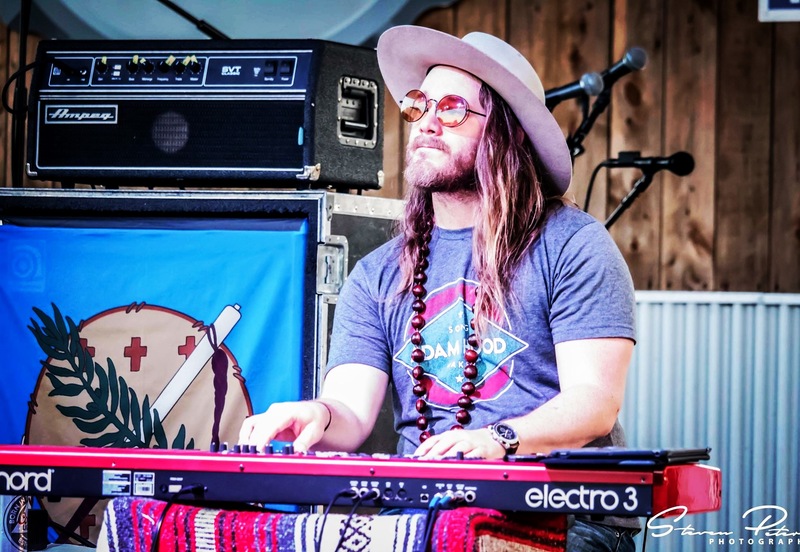 Keyboard player Sam Jones brings out his stage style with his prescription– that’s right, PRESCRIPTION!– sunnies. I’m talking dark red lenses in the circular dimension. It’s love at first SIGHT. These lenses are “different than what other people are wearing, but still hip,” Jones told TMP. They’re a great option for those who dislike transition lenses. He also feels like these glasses make life a little like “living in an Instagram filter.” In the age of high fashion and social media, who wouldn’t love that? Jones snagged these frames and lenses from Zenni Optical online for around $37 (shipping included). Cheap. Trendy. Timeless. Pair this look with a flat brim western hat for ultimate wow factor. 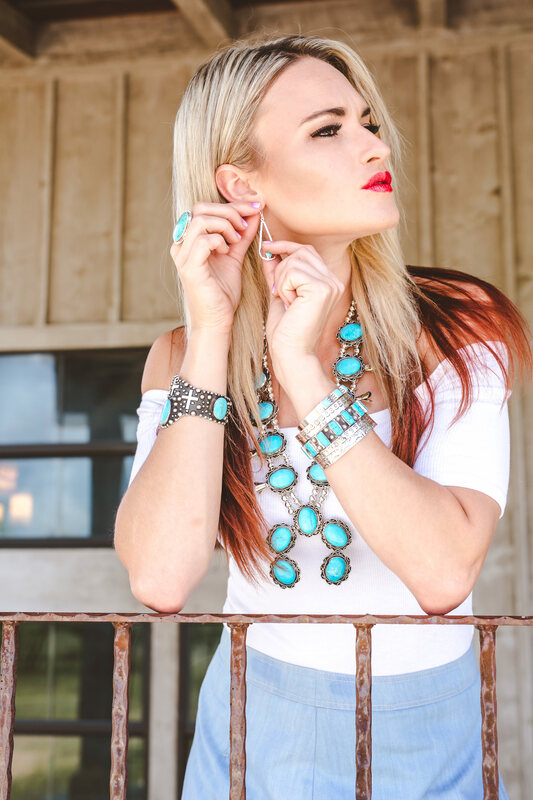 As if this lady could get any more fashionable, Bri Bagwell partnered with The Texas Silver Rush (Fredricksburg, Texas) to create a custom line of jewelry. A highly recognizable piece Bagwell added to her collection is her squash blossom necklace. Western artists have sported squash blossoms from the grittiest of guys to the wildest women. This turquoise design is a TRUE NECESSITY in every form. The only catch is they’re usually expensive due to stones and silver workings. However, Bagwell’s schedule keeps her packing light, simple clothing and accessorizing with statement pieces for ease of traveling. “Traveling is really tough on the mind, body and spirit,” Bagwell told TMP. “When it comes to unpacking and repacking each week, I don’t worry too much about the outfits. I just splurge on truly great jewelry.” Whether you’re a Western wanderer or a turquoise fanatic, this necklace is something you won’t regret owning. Bagwell said it best: “It sounds silly that great jewelry can make you feel pretty and powerful, but it can.” Pair this bold beauty with a plain t-shirt and messy hair. I’m a little peeved with Jon Stork right now. I featured his jean koozie in the last edition of Top Shop, but then he came out with pink velvet ones right after. How dare he be so trendy!? SO trendy, in fact, that I had to mention him yet again for his seriously killer shirts. Stork is the button-up, punchy prints King. He describes this featured button-up as “Aztec/brush popper style, totally different than what you’d see in a store.” The bright blue and white print has a real stunner approach about it. Although this piece is a definitely unique pattern, most of Stork’s shirts are without brand names, having been worn out from years of use and bought at second-hand places. “It’s all about getting a new (old) [shirt] and knowing they don’t make that shirt and never will again,” Stork said. “It’s all about dressing for the job you want, not the one you have. I believe that whole-heartedly, and I think the shirts bring a little more energy or attitude out of me.” And he’s absolutely correct. Be bold. Be different. Wear a conversation starter. Pair a vintage print button-up with a smile. That’s all you need before the people start to flock to you. It’s no secret that musicians love flashy jewelry. It comes with the nomadic territory. 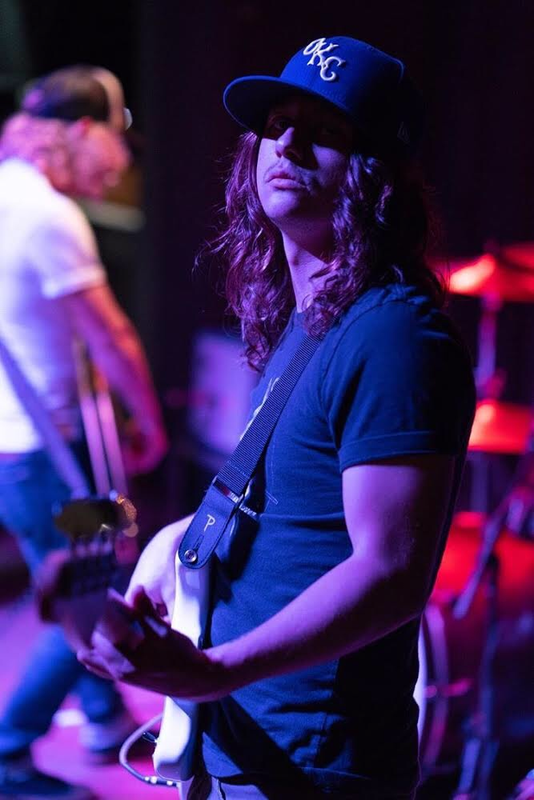 A standout craftsman making his way through our musicians is Colton Anderson of Ride Rank Silver. He’s made multiple custom silver necklaces including drummer Dre’s. Rocha wanted something unique and signifying drums, so Ride Rank made him a custom name drum pendant. 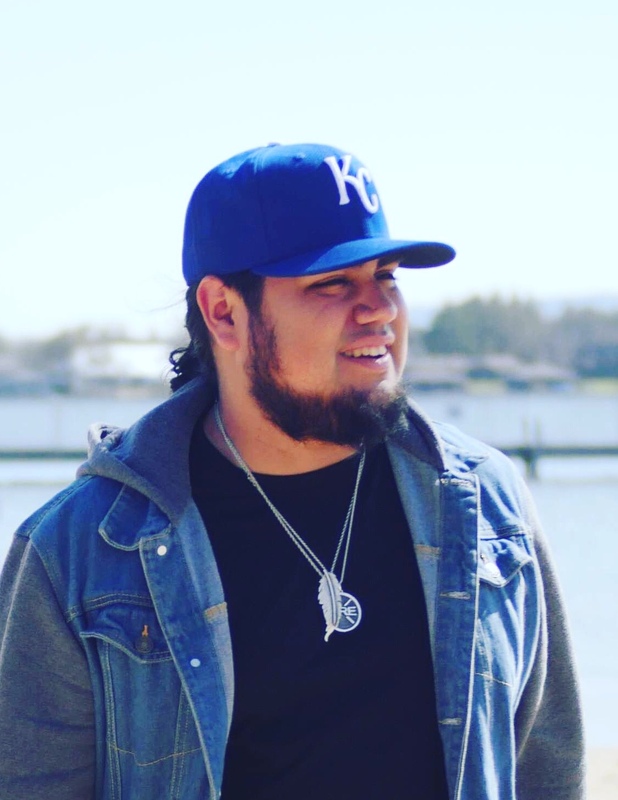 Just as other musicians wear each other’s merch for promotion, Rocha wears his “Dre” necklace to proudly show the “Ride Rank Silver product all over Texas and other states.” This piece is a necessity for custom jewelry collectors and silver enthusiasts alike. It’s versatile, meaningful, and completely yours. Western wearers LOVE a light-washed pant, am I right!? From Dwight Yoakam to Alan Jackson to Parker McCollum, these pants add pack a punch. They elevate a simple look to a head-turning country SLAP! There is a reason you think of cool jeans when you hear Yoakam, Jackson, and McCollum. 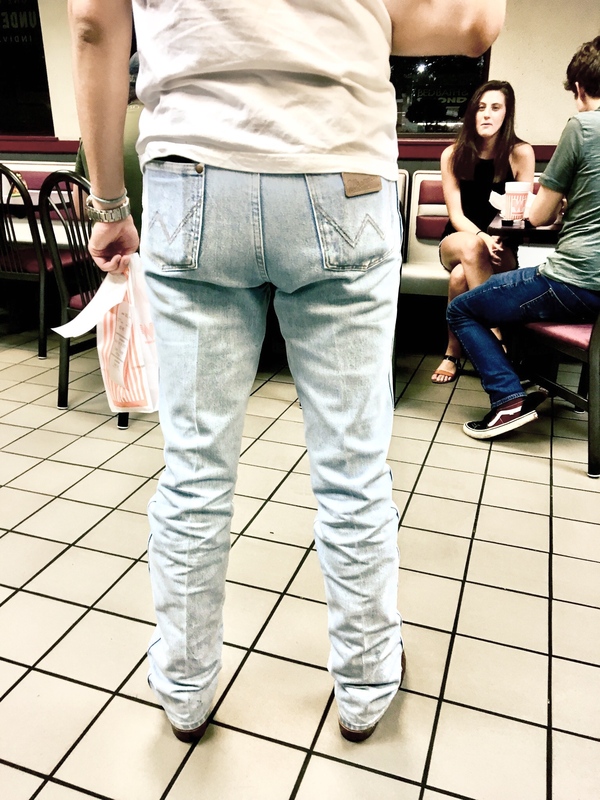 Country music fan Anthony Garibay is a West Texas man with the white wash jean fever. “I like the color of Wrangler light-washed jeans,” Garibay said. “They go with everything from dress shirts to button downs to blazers.” Proving this theory right, McCollum is a white v-neck and light jeans kind of guy while Jackson is a crisp blazer and tight Wranglers man. “I like boot cut jeans when I’m going out, but I wear straight leg when I want to wear tennis shoes,” Garibay said. “You can find these jeans from Cavender’s to thrift stores to your local Western wear outlets.” You can honestly style these pants with anything, but I suggest a small slit in the bottom of the pants to cover over the top portion of your boots. Alright boot babes, this one’s for you. Josh Serrato is master of boot finding for a deal. His black and white, busted up snake boots called out to me one night after a major concert, saying “Wow, look at how much cooler we are than your boots!” Serrato told TMP he only buys from thrift stores or eBay because he “likes ’em beat up and a little haggard.” Such a wise choice for boot buyers. Serrato gained his style by copying one of his heroes, Stevie Ray Vaughan, with snake skin and flat brim hats because he “just knew it would make [him] a better guitar player.” Although he didn’t know it’d be the cool thing to do 10 years later, Serrato really kicks the hell out of some rad style with these python thrift store boots. I guess to find a treasure, you gotta dig through the trash– cheap, round-toed mass manufactured boots included. Serrato’s Pro Tip: if you pay more than $100, you’re doing it wrong. Pair these bad boys up with a cut straight leg jean or cuffed skinnies.